Dawn Granger, known as Dove, was ready to fight crime. Instead, Hank Hall - alias Hawk- surprised his partner with a present , a mistletoe and a kiss! In fact, I dedicate my drawing to mr Gates because I am a huge fan of his Supergirl run and I wished he was longer in the Hawk and Dove book. I drew this back in 2011 when Sterling Gates was about to write the short lived New 52 H& D with Liefeld as the artist . Back then I had lots of expectations and sadly weren't fulfilled. Yet I'm still hoping there will be a new H&D comic someday and the characters will be given a chance to truly shine. Gates is still among my favorite writers (I really liked what he wanted to bring on the table) and while Liefeld's style isn't my cup of tea I , as a fellow artist, hold a sincere respect towards him. The other day I read Hawk & Dove #1 and I loved the book! Sterling Gates is an excelent writer and I also liked Liefeld´s style. So today I decided to add some colours to an old sketch, and voilá! I like this pair, and I hope someday they will be together, not only as a team but as a couple. They are a duo , Hank Hall -alias Hawk- is the avatar of War, while Dawn Granger - Dove- is the avatar of Peace. I am seriously in danger of becoming a fan of these characters as much as follow Angemon and Angewomon from the Digimon series. Jean-Jacques de Portier, my main villain from my book, usually frequented to Barras´s place. He was friends with Teresa Cabarrús, Barra´s lover, and he enjoyed going to her salons. Teresa was a very beautiful noblewoman from Spain and she also played a key role in Robespierre´s fall. 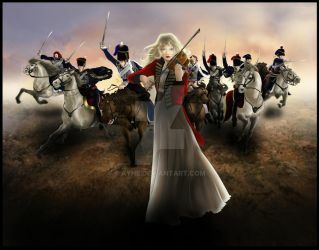 Her beauty was legendary and many men fell in love with her...among them, a young soldier called Napoleón. Barras´s his superior, and despite knowing that Teresa was committed with the elder militar and other important men...Napoleon still feel in love with her. But his love was fated to be not retributed, and Teresa actually humillated him. And Jean-Jacques would meet a very heart broken Napoleon right in the streets. "I heard of Madame Termidor ´s generousity towards your, mon ami. I heard she offered you a new uniform"
"It´s true" Napoleón sighed" I´d rather have her love"
"Your pride must be on the floors" the duke said , in a low voice "If I were you, I wouldn´t be able to maintain my composture.I admire your aloofness"
"Who says I am not angry? I´m furious!" his voice gained strength "I would give anything to pay that lustful witch back!" Jean´Jacques moved his head, in a pessimistic way. "But you are a very young soldier, with no fortune of your own." "In this current present, I might be someone with no name. But I am someone who´d never forget an insult"
"Then you must become someone extraordinary, someone by far better than Barras. No, you are the type of person who could climb to the peak of this nation...you are someone who should have access to power. Power is everything in this world...."
The soldier looked at the stranger and nodded. "Yes, indeed. And I shall seize it"
Note: I used a photo as a reference for the background and I took it from this website: [link] . I liked a photo from a street from Montmartre and I know it´s not close from Barras´s house. I used it mainly for artistic purposes, not seeking, this time, accuracy. Merci! After such a beautiful week, my soul is filled with music. Now I must finish composing my "symphony"
•I am a brazilian girl who currently lives in Buenos Aires, Argentina. • I am a former Fine Art student and also a graphic designer. • I am used to work in art galleries. • I am currently writting a book. • I don`t do art requests. Happy Birthday my dear friend ^^ Wish you the best. do you maybe wanna make a RP with me..? You are in my KINGDOM HEARTS OF ETERNITY feature.